Cheyenne Regional Medical Center (CRMC) has partnered with Dr. Matthew Robertson of Alpine Ear, Nose & Throat (ENT) and Dr. Sodienye Tetenta of Wyoming Sleep Disorders Center to be the first and only group in Wyoming to offer Inspire Upper Airway Stimulation (UAS) therapy, a breakthrough obstructive sleep apnea (OSA) treatment option for those who cannot use Continuous Positive Airway Pressure (CPAP) therapy. CRMC, Cheyenne Regional Medical Group (CRMG), and local ENT Drs. Silver and Romano have collaborated with Alpine ENT in Fort Collins to help provide ENT care for our community. Alpine ENT is now seeing Cheyenne patients at the existing Education Drive address. In 2016, Dr. Matthew Robertson, one of the five physicians at Alpine ENT, was the first surgeon in the Rocky Mountain Western region to perform an Inspire Surgery at Poudre Valley Hospital in Fort Collins. He is pleased to now offer this service at CRMC and is working closely with CRMG sleep medicine physician, Dr. Sodienye Tetenta on building this program. OSA affects 18 million Americans. When left untreated, OSA can cause vehicle and workplace accidents, worsening mood and memory, stroke, heart attack, and even death. It occurs when the airway collapses during sleep and blocks the flow of oxygen to the brain. The brain senses a lack of oxygen and wakes the body up just long enough to take a breath, then falls back asleep. This cycle repeats throughout the night and causes poor, disruptive sleep. Inspire therapy works inside the body with a patient’s natural breathing process to treat sleep apnea. Mild stimulation keeps the airway open during sleep, allowing oxygen to flow naturally. 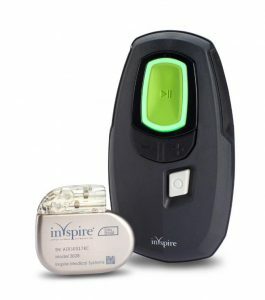 The patient uses a small handheld remote to turn Inspire on before bed and off when they wake up. If you are intolerant to your CPAP and interested in an alternative therapy with no hoses or masks, please attend one of our Inspire Informational Events. Please register at www.inspiresleep.com and click on “Inspire Informational Events”. Seating is limited.